Judith Tabron, Soul's owner, a tough-looking blonde, has a very direct opinion of the Kiwi food scene. "We were settled mainly by the British Welsh, Irish and Scottish from the working class," she says. "But the working class didn't want their children to work in the service industry, which has held up our restaurant culture. Tabron is intent on changing all that though. Scampi cocktail with avocado and Moroccan ketchup? Salmon gravlax with asparagus, whitloof, soft poached egg and Caesar dressing? Clearly she�s been paying attention is home economics classes! 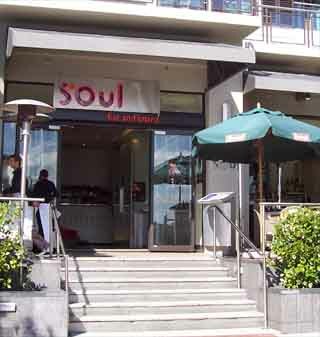 Soul�s cuisine marks a step in the right direction for Auckland�s developing gastronomic scene. Hugely popular as a result of its efforts Soul�s Viaduct Harbour location boasts great views over the water, perfect for a soiree on it�s all weather terrace as the sun goes down over the southern pacific.